Ralph Meier, President of Mitsubishi Chemical Performance Polymers in Europe, commented: "With Dutch Filaments in our group of companies, we can add 3D printing materials to our portfolio. We see the demand from customers of various industries increasing and with the acquisition of Dutch Filaments we are able to not only fulfil their needs but to actively participate in the future development of 3D printing." 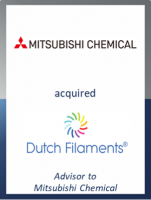 CEO and co-founder of Dutch Filaments, Richard Luiken, underlined: "Mitsubishi Chemical is the perfect choice for our fast-growing company and our expansion plans can now be realized even faster with the expertise and global footprint of Mitsubishi Chemical."